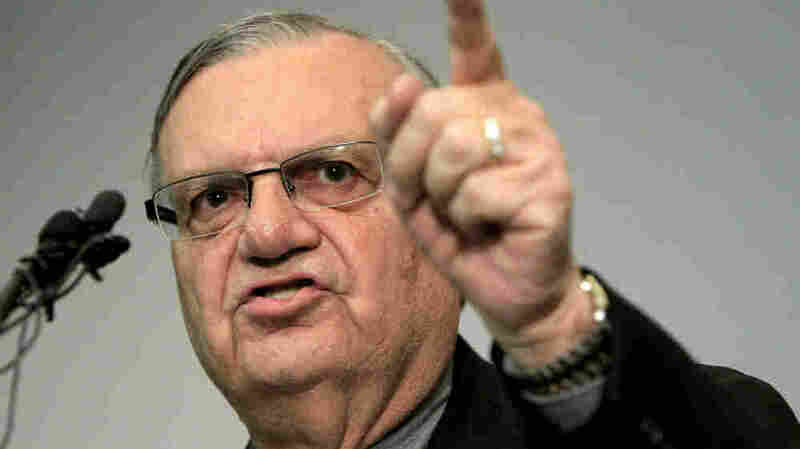 Justice Department Sues Ariz. Sheriff Arpaio : The Two-Way The federal government is accusing the Maricopa County sheriff of violating the civil rights of Latinos in his district. America's self-proclaimed toughest sheriff is facing a lawsuit from the federal government. Joe Arpaio, the Maricopa County, Ariz., sheriff, became a controversial national figure for his tough stance on immigrants. The Justice Department had previously warned Arpaio that his department had engaged in a pattern of misconduct, violating the civil rights of the Latino community in his district. NPR's Carrie Johnson reports that now the Justice Department has decided to formally accuse Arpaio of "violating the civil rights of Latino drivers and inmates in the county jail." "Civil rights lawyers at the Justice Department say Arpaio is responsible for a series of actions that go against the U.S. Constitution and federal laws. "They've charged the Maricopa County, Ariz., sheriff with pulling over Latino motorists for no reason, failing to provide services to inmates who don't speak English, and retaliating against lawyers and judges who criticized him. "The lawsuit says Arpaio has demonstrated his bias by saying Latinos are outside the mainstream. Arpaio says the federal government has no place in his business, and he says he's been following the rules and the will of Arizona voters." The AP reports that Justice Department officials said they haven't met with Arpaio's department since February, and it's been 100 days since he received the results of the department's investigation. In a news conference, Arpaio said there's a lot of miscommunication "emanating from Washington." "They're telling me how to run my organization," he said, according to the AP. "I'd like to get this resolved, but I'm not going to give up my authority to the federal government. It's as simple as that."